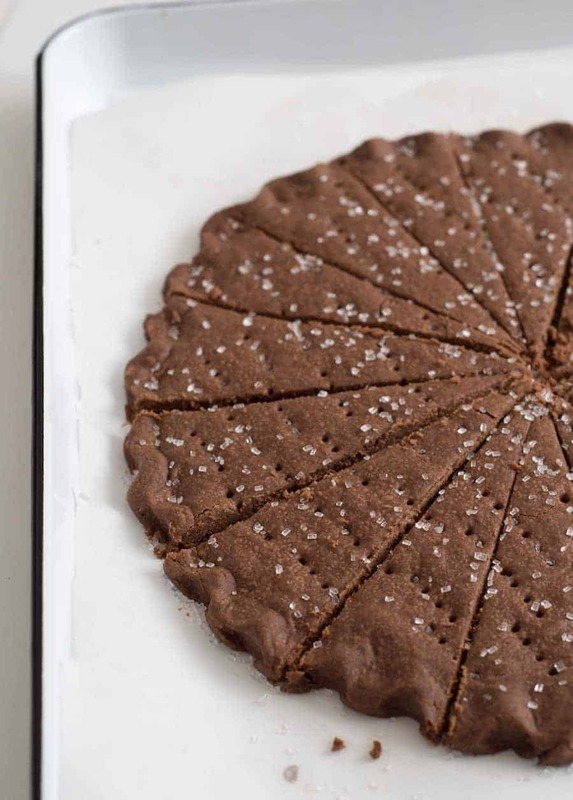 This easy chocolate shortbread cookies recipe is perfect for the holidays. Lightly sweetened, crisp, buttery cookies made with just 6 simple ingredients. 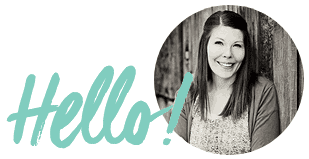 Raise your hand if you love shortbread!!! 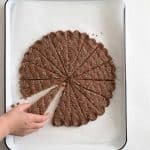 I, for one, love shortbread cookies and today I’m sharing with you one of my favorite recipes for easy chocolate shortbread cookies. I love how crispy, buttery, and melt-in-your mouth these cookies are. They aren’t super sweet either, which means eating them for breakfast with your favorite tea is totally fine in my book. 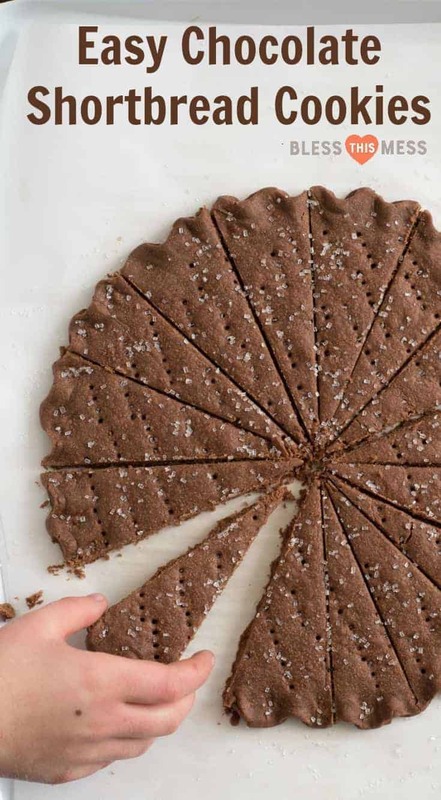 I like this recipe, too, because instead of having to make pan after pan of drop cookies, you just make one big cookie, score it into wedges, and then cut it while it’s still hot. 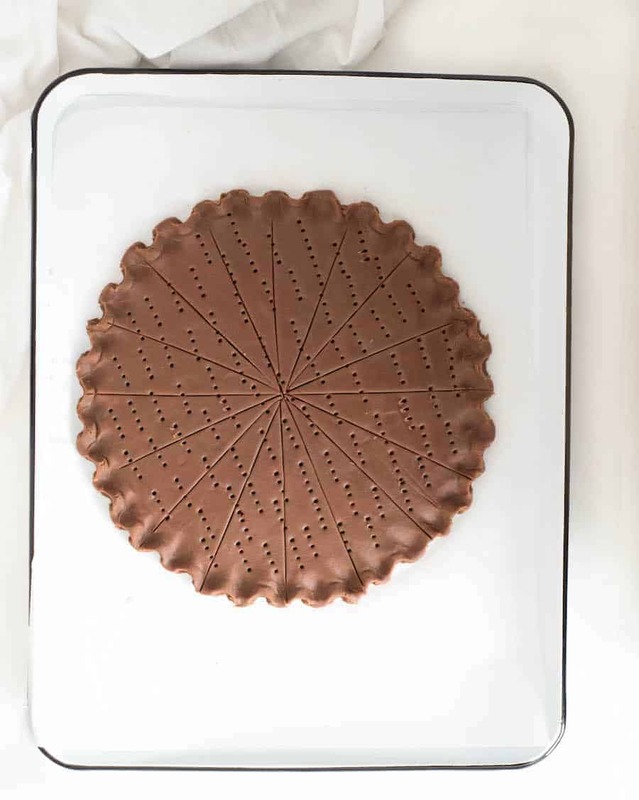 One giant cookie is always a good idea. A simple recipe with a short list of ingredients is fun to keep on hand so that when the kids are begging for a baking session or you get bitten by the baking bug, you’ll have something quick and easy to put together without much planning or a trip to the store. Sometimes simple just wins! Eat these with your coffee or tea for a mid-afternoon snack because they are so simple without being overly sweet. You are going to make this recipe again and again. Don’t try to sub other sugars for the confectioners or powered sugar, that helps create the shortbread texture of the cookie. These cookies aren’t super sweet, just FYI. Like most classic shortbread cookie recipes, it’s light on sweetness. Just so you know what to expect. I used extra chubby “sparkling” sugar in place of the granulated sugar on the top and I love it. I use it often and it’s fun to have on hand. It’s hard not to over-bake a cookie that is dark to start with, so be mindful of the cooking time and how your oven normally performs. You don’t want them under-baked of course, but over-baked isn’t great either. You can roll this dough out and cut it with cookie cutters like other cookie doughs. Just bake for about 12 minutes, depending on the size of the cookie. 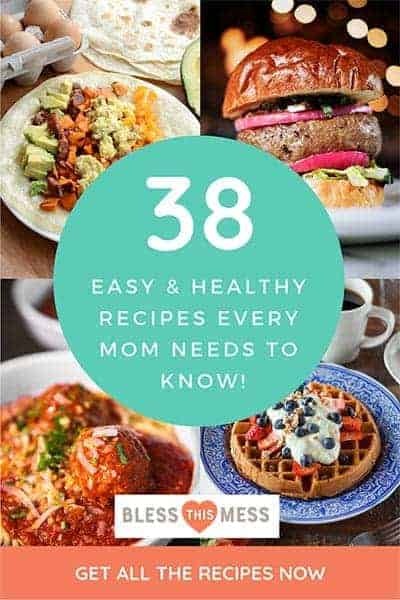 Other easy chocolate recipes that I love include Flourless Chocolate Cake, Chocolate Lava Cakes, and my forever favorite Chocolate Chip Cookies Recipe, just in case you need more chocolate in your life. 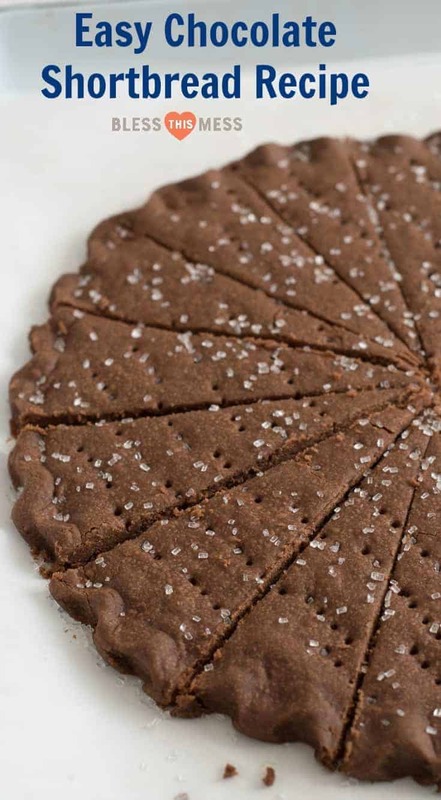 Easy chocolate shortbread are lightly sweetened, crisp, buttery cookies made with just 6 simple ingredients. In a large bowl, beat together the butter and confectioners sugar with an electric mixer on medium speed for 3 to 6 minutes. Scrape the sides as needed – the mixture should be light and fluffy. Using you hands, press the dough in a ball in the bowl. Transfer the dough to a lightly floured surface and knead it until the dough is very smooth, about 3 minutes (the heat from your hands helps the butter to melt a bit and the dough to come together). Press the dough into a round disk, place another piece of parchment paper on top, and roll it out into a 9-inch circle, about a 1/2 inch thick. 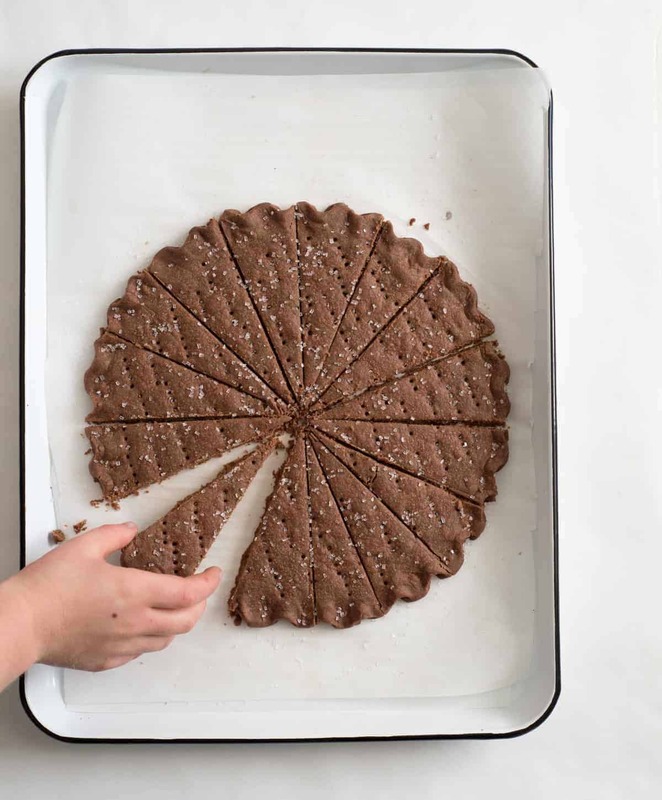 Transfer the dough and the parchment paper to a parchment-lined baking sheet (the double layer of parchment helps to absorb some of the extra grease in the cookies). Crimp the edges of the circle with your finger and thumb. Use the tines of a fork to poke holes in a circular pattern all over the dough. Then use a small knife to score the dough into 16 wedges (don’t cut all the way through the dough). Cover the chocolate shortbread with plastic wrap and refrigerate for 20 minutes (this helps the cookie to not shrink while baking). Adjust the oven rack to the middle position and preheat the oven to 300 degrees. Sprinkle the shortbread evenly with the granulated sugar. Bake the cookie for 40 minutes. When the cookie is done baking, place the baking sheet on a wire rack and use a sharp knife to cut through the scores, separating the wedges, while the cookie is still hot. Let cool on the baking sheet for 10 minutes and then transfer the shortbread to a wire rack and let it cool before serving, about one hour. Recipe from the America’s Test Kitchen Family Baking Book. One of my all-time favorite cookbooks. How fun would it be to serve this cookie whole at a party or for a birthday?! It’s so pretty all together in the pan. I’m telling you, simple is where it’s at. Do you bake it with both layers of parchment paper or just the bottom one? It looks wonderful and it’s good to have options for less-sweet treats. I’ll make this for sure! Use both if you have them! I love love love shortbread cookie and so exited to have found a chocolate one! It looks amazing and I love the cute little hand grabbing a piece! Can you freeze short bread? Yep, just make sure that the bag/container is really airtight because any moist freezer air that gets into the container will take the crispiness out of the shortbread.